Palestinian-American anti-Zionist Linda Sarsour compared 'right-wing Zionists' to white supremacists and neo-Nazis at a rally backing embattled NFL quarterback Colin Kaepernick. "We will not be silenced by Blue Lives Matter, by white supremacists, by neo-Nazis, or right-wing Zionists," Sarsour said. "Expect us every time there is a fight against injustice." Sarsour was supporting Colin Kaepernick, an NFL player who refused to stand for the national anthem before games. Kaepernick has not been signed by any football team for the 2017 season, something left-wing activists attribute to a backlash against Kaepernick's opposition to the national anthem. Sarsour has made a long line of inflammatory remarks against Israelis and Zionism. Sarsour has praised convicted PFLP terrorist murderer Rasmea Odeh, when the two addressed a left-wing conference in Chicago in April, saying she was “honored and privileged to be here in this space, and honored to be on this stage with Rasmea.” Odeh was deprived of her US citizenship and deported in mid-August. 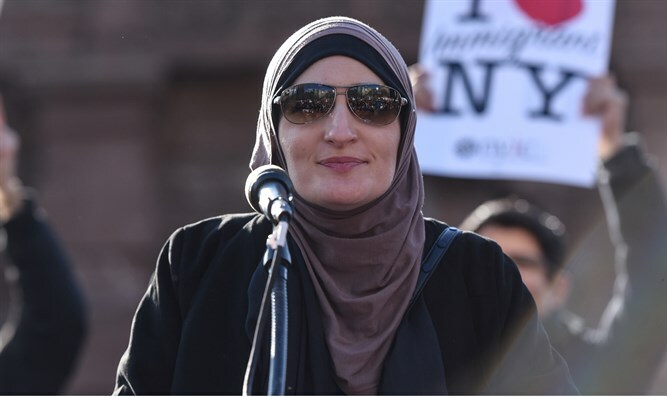 Sarsour also recently called for Jihad (Islamic holy war) against the Trump administration. She later claimed that her remarks were taken out of context, writing in the Washington Post that "I sent not a call to violence, but a call to speak truth to power and to commit to the struggle for racial and economic justice."